It’s pretty obvious that I get a lot of my inspiration from nature. 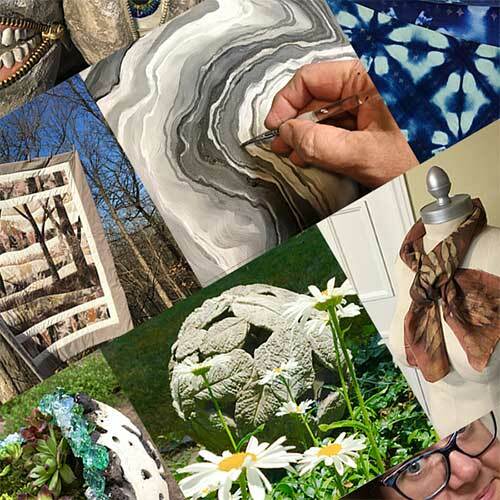 When I discovered there is an art form that gets a helping hand from ‘Mother nature’ I was super excited! 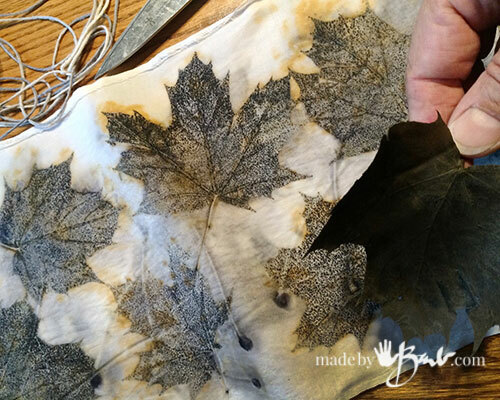 Magic happens when leaves and fabric come together under the right circumstances. I have lovingly spent the last few months experimenting. The results are so amazingly beautiful and often unexpected. I liken it to christmas each time I unwrap one. This post will be a bit of a teaser; an introduction to Eco Printing, as this process can not be explained on one page. Mother nature works her magic so I hope to clear up some of that mystery through this post and future specific ones. 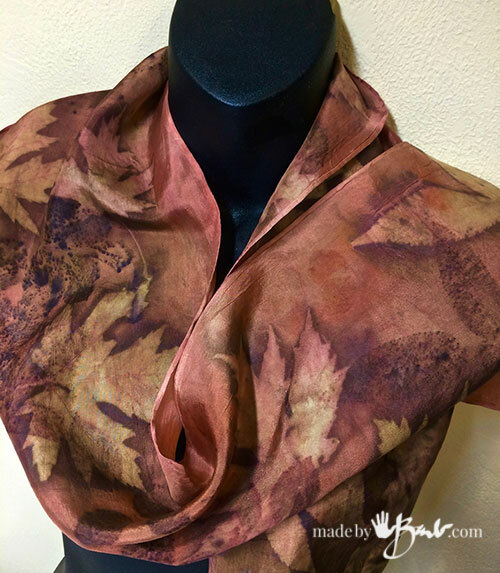 The basic principle of eco printing is that various leaves and plant material (fresh or dried) possess tannins which have the ability to print permanent colour onto fibres in the form of fabric when combined with the proper procedure. Not every leaf will be as successful, as some have much higher tannin content than others. The top side and bottom both may yield different results. Results may vary from zone, time of year and even time of day, as there is so much invisible chemistry happening. It is directly related to the art of dyeing with natural plant material. A few pioneers in this craft; India Flint and Irit Dulman have made wonderful discoveries over many years of experimenting. The process usually involves some form of heat and also some pressure to create a distinct print. It is that time of year here in Canada when the leaves are shedding so it may be the last chance to collect until spring. I have experimented with my local collection and now have my favourite species to collect and store. But don’t feel limited to these. Silver Maple, Sumac (various varieties), Rose, Japanese Maple, Blackberry, Hedge Maple, Walnut, Dark Horse Weigela, Catalpa, are a few I’ve tried. If you have the luxury to obtain eucalyptus there are species that will print bright oranges and reds. Like a squirrel, I have been stock-piling my leaves for winter. 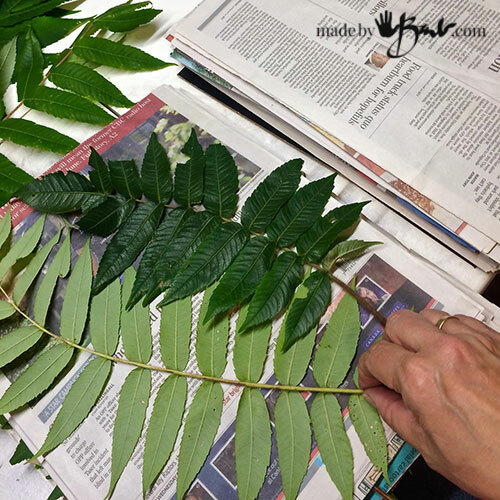 Place leaves in a single layer between multiple sheets of newspaper. I had tried books but they became too full and had more chance of having mold develop since they could not provide enough air circulation. You can stack the piles but do not put too much weight as then they may not breathe adequately. Sumac is available along roadsides in abundance and maples are quite common here. 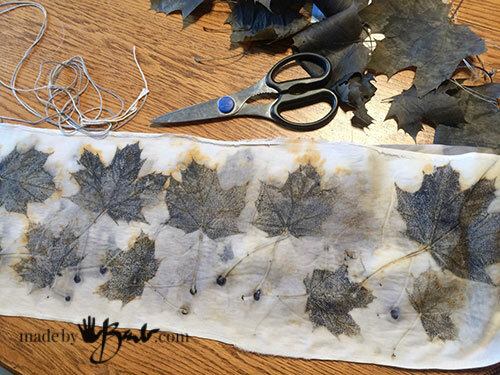 This process however is not as simple as just plopping some leaves onto fabric. 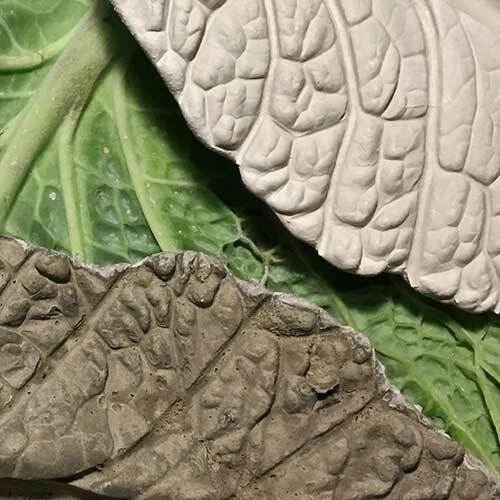 To make the molecules adhere there needs to be a ‘mordant’ that acts like a molecular bond between the fibre and dye of the leaves (plant material). These mordants are commonly metal ‘salts’. 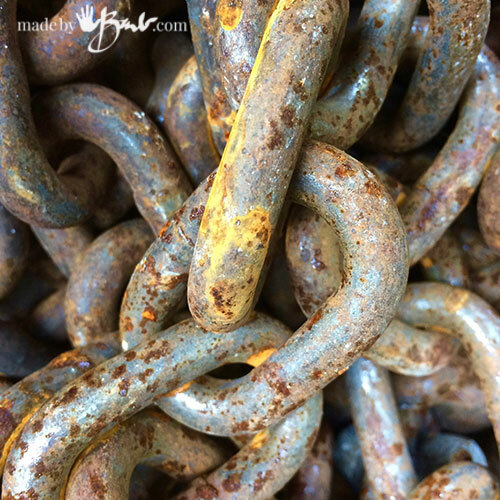 One of the readily available metals is iron. Making a bucket of ‘iron water’ can be as simple as collecting some rusty chain or railway spikes. As when dealing with any chemical; do exercise caution by wearing gloves when working with the solutions. Other readily available mordant is ‘Alum’ (Aluminum Potassium Sulphate) which is considered safer than many ‘metal salts’ since it is used in the treatment of water and commonly used when making pickles. It can be obtained in the spice aisle of grocery stores. 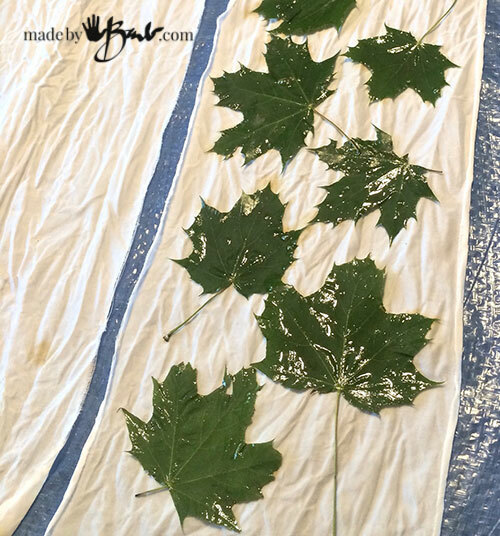 Some eco printing can be as simple as using a quick dip in some ‘iron water’ to help the leaves’ tannins adhere to the fibre. Since there are chemical reactions happening between so many materials, slight variations bring different results. Once the ‘magic’ happens many artists like to keep it a secret so it may take some personal experimentation to have the entire puzzle to come together. Historically, dyeing fabric with natural plant material has been around since 100 A.D. Applying heat to a vessel of dye and submerging the textile is simple however the retaining of the colour through time and laundering may not be so easy. Some colours may be wonderful however are called ‘fugitive’ as they disappear over time. To assure colourfastness careful scouring and mordanting is required. ‘Cellulose’ includes fibres made from plants such as; cotton, linen, ramie, hemp, bamboo, and rayon. ‘Protein’ includes fibres that come from the fur or hair of animals or spun by an insect like the silkworm. Besides the obvious Sheep wool, there is Alpaca, Camel, Angora goats, silk and Cashmere. Speaking generally, protein fibres do tend to take dye easier and thus yield better eco printing results. Some of the processes include alkalinity and acidity which behave differently with each fibre. 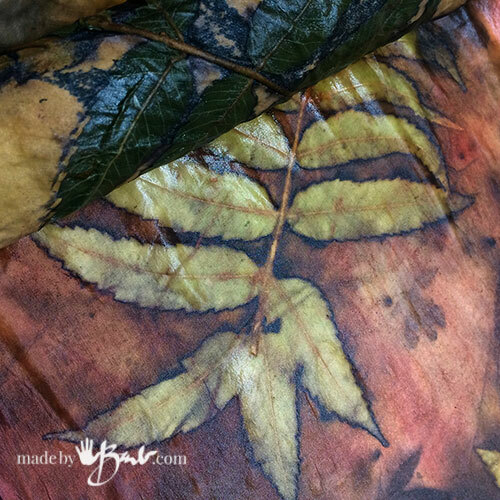 Shown here is one process of laying tannin rich leaves that have been dipped briefly into iron water on damp cotton fabric. 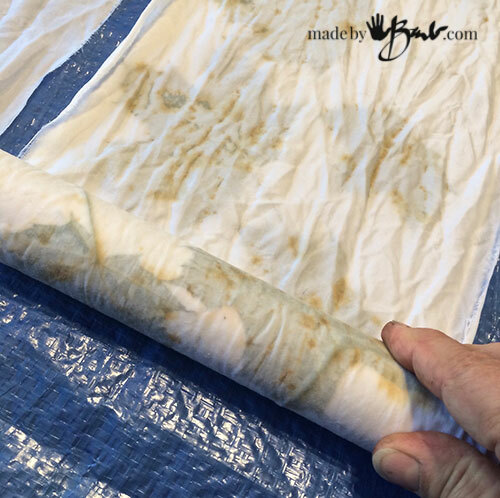 The fabric should be first scoured well to clean any residual substance from the fibre. Scouring methods vary according to fibre as well. To assure a clear print pressure and contact between plant and fabric is also important. There are various ways of layering and folding with rolling being one of the most common methods. 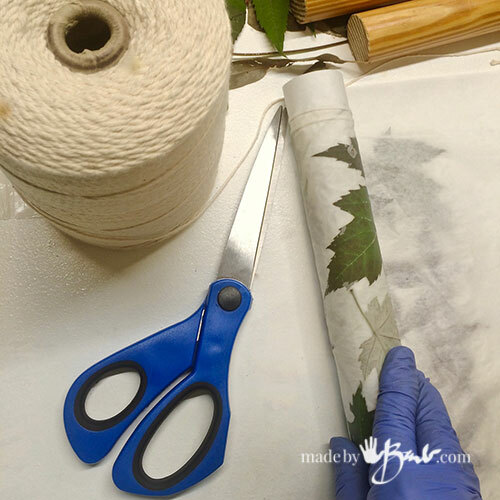 The rolls can be made on pipes, branches or wooden dowels. The material of the centre may also play a key role in the chemistry reaction if made of a metal. 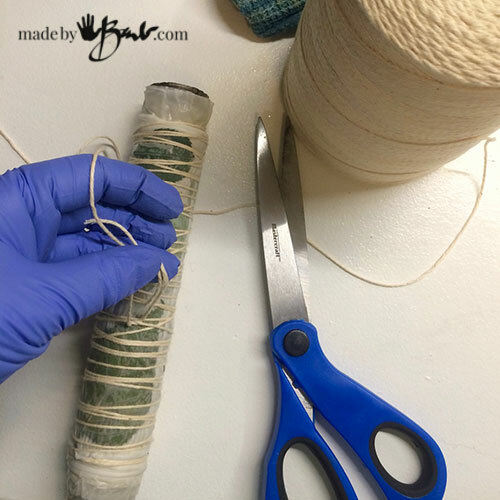 To create good contact and pressure the roll is tied quite tightly with twine. There may also be some other ‘barrier’ material involved to stop colours bleeding through layers. Sounds complicated?! It really isn’t once the basic principles are understood as then it’s like cooking; so many possibilities! 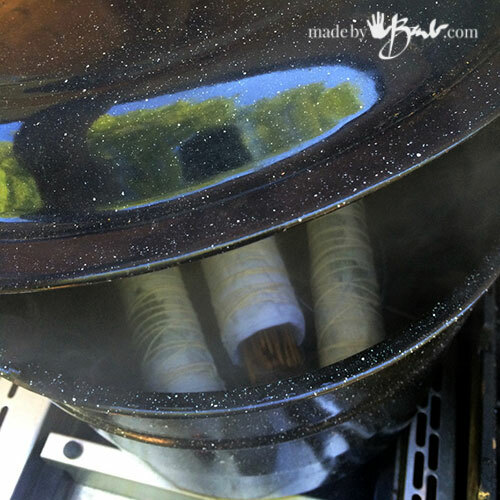 Speaking of cooking… The process does involve heat. The rolls may be steamed or even submerged and boiled; each with different results. Experimenting is key, as changing any part of the process often yields different results. As notes are taken and successes documented, results can still be unexpected. Since it is not visible what is happening until it is unrolled, the anticipation is always exciting. As with anything that is difficult to attain, it is much ore rewarding once you do! This is one of my first prints that I was quite happy with. The dark results came from a strong use of iron as a mordant. Results are not always guaranteed so any results are quite welcome and may be used to create unique one of a kind crafts and clothing. The intricate details that print are quite remarkable and can vary according to the choice of fabric. As with cooking and baking, combining more ingredients gives more variety of results. Using a dye bath before or after ‘printing’ can give the design a whole new dimension. 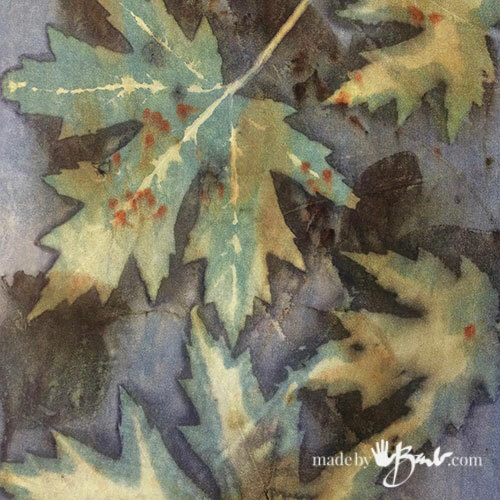 Prior to eco printing this silk scarf was dyed with indigo dye. How absolutely amazing is this print on silk?! The red background is from dyeing with madder root, another natural botanical dye. As an artist, I have spent many years painstakingly hand painting details on landscapes and designs. 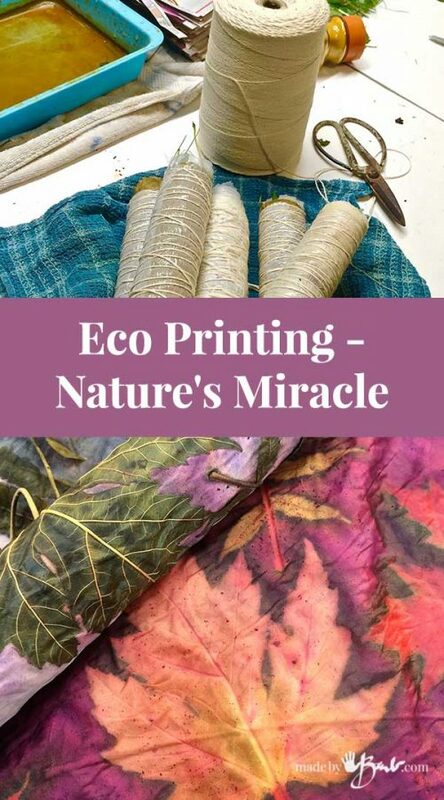 Eco printing however does not involve that skill but relies on nature’s magic and a bit of know-how. I do not profess to be a complete expert but will share some of my detailed successes. You say “I am an artist & I make things”. That is only partly true…you are a genius who makes beautiful things. I get great pleasure from viewing your work. I am in awe! So thrilled with this article. I dye wool everyday for rug Hooking. Are their winter plants that might work? Evergreens, holly, or house plants? I have not had good luck with the evergreens. I don’t have enough houseplants to spare. I do have a stock-pile of leaves from the summer – fall. They work quite well. I have looked into the rug hooking since I have a bit of a stock-pile of wool blankets too… Some florists may share their cast-offs; rose leaves (not petals) print well. They came out so beautiful!!!! I’ve been wanting to try the natural printing for some time but haven’t go around to it…. I can wait to see more of what your doing! You have so inspired me to try my hand at this. I am in awe of your talents! So beautiful! I’m guessing the fabric must be dry cleaned not washed? No, as dry cleaning uses some crazy chemicals. I wash them a couple times after printing and use a mild ph neutral soap. (like Dawn) The whole idea is that the colours bond well with the fibre. There will be some posts up soon… Enjoy! Astonishingly beautiful final creation. Thank you for beautifying Barb! You make beautiful things! I am very new to eco printing. Have you done much with paper? Hi Barb, I am so thankful for your candid share. I, too have been experimenting since May of 2017 and it took until October to finally get some great results. I was able to check off all the things I’m doing right and gleaned some ways to make adjustments! Thank you so much. I’m an Alberta girl, I GET winter. Barb, what amazing work you do. I have ideas percolating in my head just by seeing the results of your art. Thank you for sharing your process. You are very generous as well as ultra talented. I have been eco-dyeing for a couple of years; using silk, linen and papers. Your writing and results are the clearest and most beautiful I have come across. I wish I had had your blog when I started as you have really lain it all out for beginners and for those of us who have experimented for awhile. Thank you for this generous sharing. Amazing work. This excites me to try it. Have you also done this with alum as you mentioned it as other mordant. There are probably as many methods as artists trying it! I tend to use the alum for the cotton printing. It’s an exciting artform that doesn’t always act like you expect. Due to the sensitive chemistry slight variations give different results. But as someone once said; things that come easily usually aren’t that valuable. I usually use the vinegar for my silk. Absolutely wonderful work, I am so grateful that you share your experiences and knowledge gained through your experiments. Fabric dying and eco dying have long been a desire of mine, and after reading your information I will be giving it a whirl come spring. I like the cleaner looking results and the overdying techniques, so this will be a challenge for me. Do you have a preference if you purchase dyes, or do you always use eco dyes made yourself from plant product. Again, thank you and I will be following. I live in México and want to start making ecoprinting. Your instructions are wonderful. Thank you. There is so much possibility in this art form. Be prepared to try various tests and you never know what you will achieve! Good Luck!! I tried exactly the way you have instructed using Iron water and my result was very stunning. I did it on the pure silk fabric, as well on pure soft cotton. They both brought out their unique results. Now I want to experiment few different methods. I live in India, and in my home town the farmers raise silk worm as well spinning and fabric production takes place, so I get the best 100% pure silk I am able to find for a most reasonable price too. Once again Thank You so much. Very interesting! Isn’t it fascinating?! 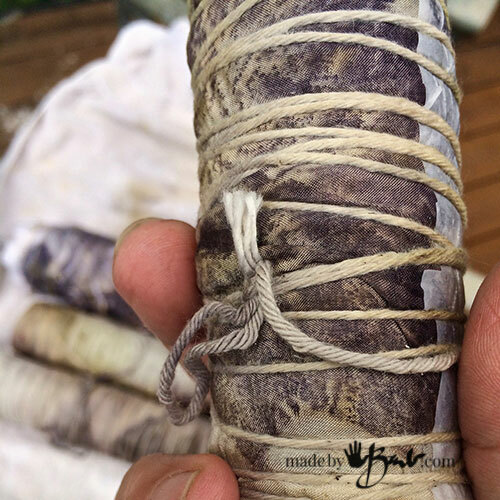 That will be just the beginning… Check out the cochineal dyeing and more. Have fun! Come back often, I’m just about to start printing again as the leaves are just about grown… Wish the day had more hours! Me encanta tu trabajo eres muy génerosa estoy probando con lo que enseñas así que de a poco voy mejorando y eso es muy bueno, tengo una duda cuando hablan de ecoprint y médium print no se que diferencias tienen aquí en Chile hablan de eso pero es casi imposible que te los aclaren me puedes ayudar con esa duda por favor, y como te decía estoy completamente enamorada de tu trabajo muy agradecida de encontrarlo un abrazo. 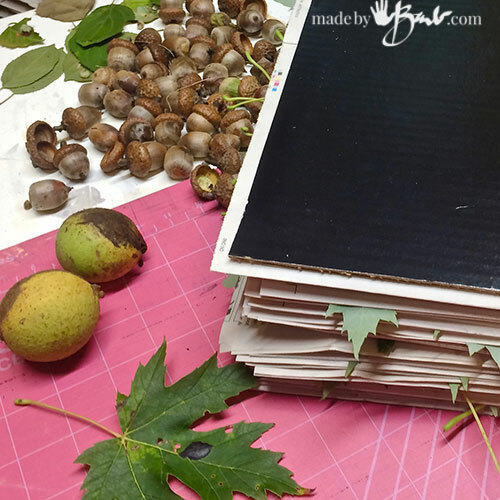 I’ve been very inspired by your website and am about to start experimenting with eco-printing myself. I wanted to ask you how you scour your silk before you begin making your scarves? I’ve read about many different methods and wasn’t sure how to start and would appreciate your advice. Since I have had such good results I have used no scouring on the silk that I buy. Do you mean mordant? I have mordanted with some diluted vinegar and also not used a mordant at all. Be careful not to use a washing soda (soda ash) on silk as it will damage it. Some dyers use a alum mordant. So much depends on many factors, so sometimes it’s just best to give it a try… Small tests will start to give you something to compare against. But don’t be too sensitive if it does not go perfect, that’s the nature and the pleasure of having a challenge and then succeeding! Let me know how it goes! Thank you for such comprehensive instructions on ecodying! I’ve been interested in trying this technique of dying but hesitated due to other’s incomplete directions. Now I’m ready to give it a go! Do you have any tips for dyeing linen? Like mordants? Any advice would be very appreciated. Your blog is a true wealth of information! Awe, thanks! It IS wonderful to use nature! And it is so generous to give us so much. Fresh air is good for the soul! Happy making! Do you give instruction in one form or another? I would like to learn this art form., but the information out there seems so spotty and somewhat disjointed. I have seen your work and admire it. I would be interested in learning from you if possible. Thank you for sharing all of your wonderful eco print information. You get amazing results! I am a novice eco printer, and have learned so much from studying your blogs. You mentioned mordanting your silk scarves in vinegar. I’d like to try this, but am wondering how long you soak them, and if you soak them at room temperature, or with heat? I don’t use heat, just soak for at least an hour. Silk takes printing so well even with out it. I use about a 50% dilution. Learning eco printing is challenging as everyone has a bit of a different way of doing things and all the variables from all over the world make for such varying results. One can not be too literal in my opinion. Embrace your art and enjoy! Truly inspiring information and photos! I think it’s one of the first art medias that I have tried that does NOT give me absolute complete control over the results… maybe that’s what makes it ever so enticing! Trust me, the nature of this art form means for some (alot) of experimentation. 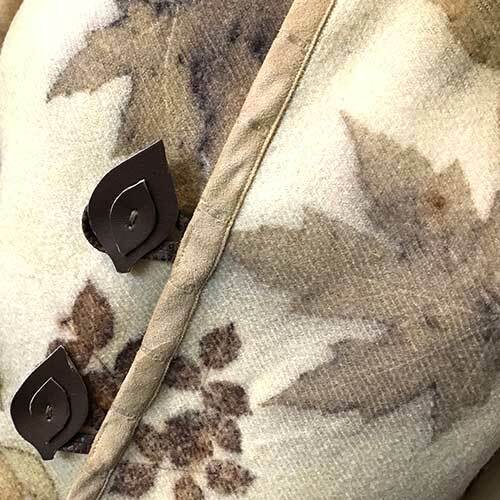 Sometimes the same leaves print differently according to weather. Embrace all your results…. Good luck! Thank you for sharing your process. This excites me to try it. It’s much fun with so many unexpected results. Good luck! Thanks for your info. it is the best I have found. Now I will get busy experimenting. Kaz: Yes! takes tons of time and effort! Hoping it will be worth it at some point. One thing; I may be using more percentage of my brain. I just love learning and the challenge of figuring things out! The harder it is the more gratifying it is once it works! Happy making! Oh My! This is freaking AWESOME! Love it and love that you shared it. I hope I can try it within the upcoming year. Thank-you so much. I’m loving your information, thank you so much for sharing. I’m trying to get my head around a few details, I hope you can help me. I’m scoring my cotton and want to dye it in indigo for the coloured background. Do I also need to soak it in soy milk? Also, I’d like to use the iron blanket to create the shadow around the leaves. 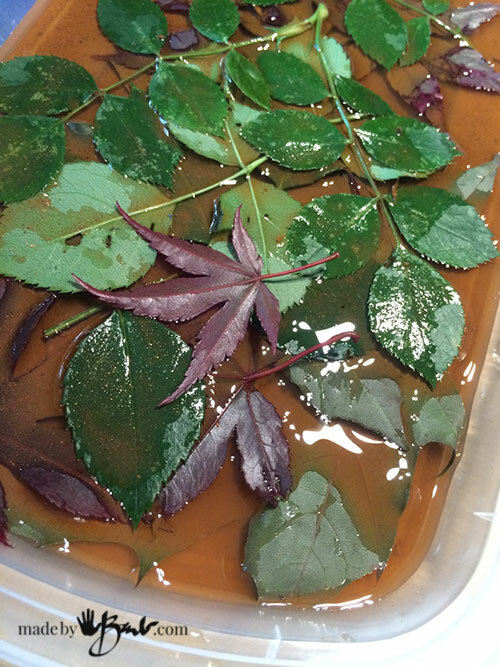 Do I also soak the leaves in an iron bath? I’d like it to be as colourful as I can. Many thanks. 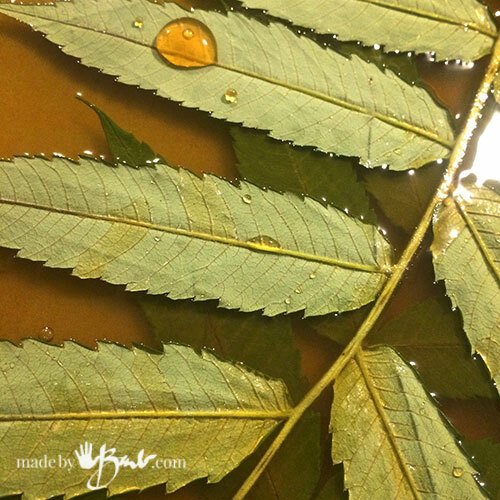 If you soak leaves in iron they will not show as outline. Best thing is to do small test runs… Happy printing! Love all your posts! How long should you boil or steam the fabric?